These scrolls were commissioned by a California Dojo, who wished to have traditional scrolls that depicted both their affiliation with the Sei Kosho Shourei Kai which is at http://www.skski.net/ and their following of the Style of Koshoryu Kenpo. It is based upon the teachings of Buddhism. James Mitose is credited as the man who originally brought Japanese Kenpō to Hawaii in 1936. Kosho Shorei Ryu Kempō is the martial art within the parent art Kosho Shorei Ryu, which originated in Kyushu, Japan in 1235 and was taught only to family members and monks staying at the Kosho-ji Temple. As an art of Sohei Warrior Monks, this art is primarily one of spiritual development and holistic self-cultivation, and secondarily one of self-defense. There is no offensive martial aspect of this art traditionally. It is only used to protect life. Working on these scrolls was very fun. The size of the scrolls being uniform will allow them to complement the dojo in a side by side manner. The spiritual nature of making a scroll is reflected in this form of Martial Art. 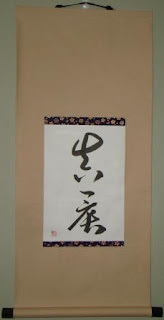 This scroll is sold, if you would like a similar scroll made please contact sales@customjapanesecalligraphy.com. The Book of Five Rings was originally written by 宮本武蔵Miyamoto Musashi. Musashi is considered one of the most successful Ronin 浪士of all time. Ronin is the term for a Masterless Samurai. Exploits of Musashi’s life are part of the lore of Japanese feudalism. As one of the greatest swordsmen of all time, Musashi wrote a book on the five principles characterizing his fighting style. Hence the book is referenced as five rings, all progressing on each other. I made this scroll in honor of the five enlightening principles of battle outlined by this warrior. The principles are written as 地(Chi) Earth, 水(Mizu) Water, 火(Hi) Fire, 風(Kaze) Wind, and 空(Sora) Void or Empty Space. This is the same character used for Karate. The Calligraphy is written by Ryugyoku. Her attention to detail is outstanding and truly reflects the care for which she aspires as a Shoka. This style although similar to a semi-cursive style is not typical of a true gyousho writing. The most particular elegance of the character wind, is exemplified by the continuous shapes of the inside box, typically written in three styles. Because the scroll writing starts with Earth, I wanted to use a nature themed cloth that was not too overwhelming. The gold leaf pattern in this cloth seemed to fit naturally into the emotion of the work. I really loved doing this work and feel that this scroll has good balance of not being too small or too large. This scroll is available for sale. Please contact sales@customjapanesecalligraphy.com for more details. The sumi-e for this scroll was completed by Ren Adams. I really enjoy her nature scenes, as you can tell from the number of works I frame for her. This scroll had some difficulty throughout production. 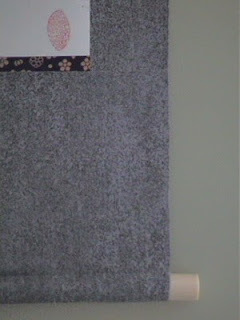 Primarily the "mimiori" was not correct on the top right hem. As a result, I did not put plastic Jikusaki on this scroll. However, I did like how the overall work displays with a Red cloth to make the green in the peppers to stand out. I then tried to soften the overall feel by using a neutral white cloth for the Ten and Chi. 布袋 Hotei is commonly referred to as the fat Buddha. He is depicted as a jovial, smiling personage. 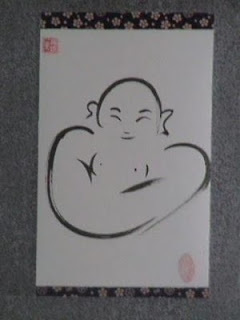 This sumi-e was painted by Ren Adams and is a very simple, but elegant piece. This scroll has a light easygoing feel, which complements the ideals and personality of Hotei. In designing this scroll, I went through a vast amount of cloths to match. I knew I wanted to use this blue kinran cloth because the patterns of the gold thread reminded me of a lively fireworks show in Japan. At first glance, the cloth may seem to be a little dark, but I purposely chose this pattern because it matches almost perfectly the stone statues seen throughout Japan. This marble texture seemed to perfectly complement the idea that this could be turned into a statue. This scroll is about 2.5 Feet in length and 1 Foot wide. There was one flaw near the Jikubou, where the cloth did not adhere to the Souurauchi, but the wrinkle is camoflauged by its position of attachment to the Jikubou. This scroll is available for purchase. If you are interested in pricing, please contact Jonathan Maples at sales@customjapanesecalligraphy.com. This scroll was a commissioned scroll and is already sold. To work on designing your own scroll, contact Jonathan Maples at sales@customjapanesecalligraphy.com. This is for the name Martha. It was translated phoenetically as Maasa or マアサ in Hiragana. Because it is a foreign word, it would be more appropriate to list it as ﾏｰｻ in katakana. It was decided to use the characters 真 which is in the word truth, reality or genuineness. The second character used was 晨 which is a character indicating activity and vibrancy. The tan color of the scroll is complemented with a black kakehimo and black wooden lacquered jikusaki which give the scroll an extra look of elegance in its design.